# Run this from your command line terminal. If you are having trouble, scroll down to the troubleshooting section. If everything worked correctly, you should see some model predictions. Let's walk through what happened during this process. 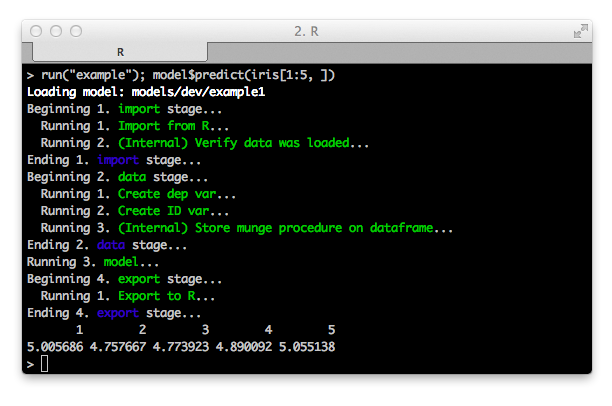 We started R, upon which it immediately began processing the project's Rprofile, the file all R sessions execute during startup. The Rprofile in the example project installed the devtools, purrr, and R6 packages from CRAN as well as testthatsomemore and lockbox. The former is an extension of the testthat R unit testing package, whereas the latter is an equivalent of Bundler for R: it will keep a separate directory for all of the packages we download so they do not clash with your global R package versions. calls. This ensures pushing and pulling the project to and from version control loads an R session with the same packages across your whole team's computers. Lockbox installed some packages, the most important ones being syberia, director, mungebits2, tundra, and stagerunner. These form the core of the current Syberia modeling engine. As with the Unix philosophy, Syberia aims to create small, reusable tools that do one job well. and will manage all the files and directories in your project. During project bootstrapping, the project's engines file was read to understand what "kind" of Syberia project you will be working on. In our case, we wish to make some production-ready machine learning models, so Syberia downloaded and loaded the modeling engine. Similar to Rails engines, Syberia itself is a skeleton and offers no functionality: all of the real meat is in the engines you mount and use in your projects, and creating new ones is trivial. The modeling engine's engines file specified a dependency on the base engine. For now, most Syberia projects will be built off the base engine, but this may change once Syberia starts replacing outdated R project structures like packages. so that they do not clash with your global namespace. If you ran into any problems during the above process, continue reading for the troubleshooting guide (or use ctrl+F to jump straight to your error message). Otherwise, you can file a new issue on GitHub explaining your problem and the Syberia core team will jump to the rescue.